George McGovern’s passing on Sunday at the age of 90 provides further evidence, as if any were needed, that if you live long enough, even your adversaries will end up singing your praises. Consider first these attacks on the late senator and presidential candidate in the 1972 election. This clichéd version of McGovern’s politics was never accurate, but it became a stick with which hawkish journalists and politicians tried to beat back dovish ones. In fact, no Democrat, and perhaps no modern politician at all, can be said to have shown more courage, more grit, and more determination than George Stanley McGovern. Yes, folks, the “elitist” liberal was born in the 600-person farming community of Avon, South Dakota, and grew up nearby in the equally small town of Mitchell. A bashful son of a Methodist minister, McGovern grew wary of “the excessive emotionalism of some evangelists” as he came of age in an America where his father was occasionally compensated not in cash but in cabbage. [McGovern] volunteered for the U.S. Army Air Forces upon the country’s entry into World War II and as a B-24 Liberator pilot flew 35 missions over German-occupied Europe. Among the medals bestowed upon him was a Distinguished Flying Cross for making a hazardous emergency landing of his damaged plane and saving his crew. Upon returning and earning a bachelor’s degree from tiny Dakota Wesleyan University, the young veteran did a brief stint at Garrett Seminary in Chicago before enrolling in the graduate history program at Northwestern University, eventually earning his doctorate. There, McGovern would both anticipate and then echo revisionist Cold War historians, among them William Appleman Williams and Fred Harvey Harrington, who held that Harry Truman and company, rather than Stalin’s Soviet Union, were largely responsible for causing the Cold War. McGovern explained that “we not only overreacted” to the Soviet Union but “indeed helped trigger” the Cold War “by our own post-World War II fears.” He wrote his doctoral dissertation on the 1913 Colorado coal strike, and his research would later lead him to demonstrate much greater sympathy for unionized workers than pretty much any other Farm Belt politician. McGovern taught briefly at Dakota Wesleyan College before returning home to South Dakota to undertake yet another unlikely and quite daring adventure—to almost single-handedly build the state Democratic Party organization. He had to scrounge to stay afloat, sleeping on friendly couches or in his car as he crisscrossed the state, personally recruiting 35,000 new Democrats. He then deployed the organization to run for Congress in 1956 and later for the U.S. Senate. He lost his 1960 Senate bid (and lost his House seat in the process) but succeeded two years later—serving as the head of the Kennedy administration’s Food for Peace program in-between, marking a lifelong commitment to feeding the hungry worldwide, and making valuable friends inside the administration. McGovern first came to national prominence toward the end of the 1968 campaign for the Democratic nomination for the presidency. Following the June 6 assassination of presidential candidate Robert F. Kennedy in Los Angeles, his devastated supporters first tried to convince his younger brother Ted Kennedy to assume the mantle of RFK’s peace-and-civil-rights-themed campaign. But Ted was in no shape, physically or emotionally, to do so. In one of history’s forgotten footnotes, McGovern took up the cause. Vietnam—the most disastrous political and military blunder in our national experience. That war must be ended now—not next year or the year following, but right now. Beyond this, we need to harness the full spiritual and political resources of this nation to put an end to the shameful remnants of racism and poverty that still afflict our land. McGovern’s goal was to try to reanimate the antiwar passion of the Kennedy crusade with his own brand of simple Midwestern morality. “I wear no claim to the Kennedy mantle, but I believe deeply in the twin goals for which Robert Kennedy gave his life—an end to the war in Vietnam and a passionate commitment to heal the division in our own society.” Though he was not well known, Robert Kennedy had judged McGovern to be “the most decent man in the Senate,” and he was hardly alone in this view. Following the disastrous 1968 presidential contest, which saw Richard Nixon elected (beating then-Vice President Hubert Humphrey), McGovern returned to the Senate and became its leading voice on Vietnam. He co-sponsored an amendment with liberal Republican Sen. Mark Hatfield of Oregon to cut off funding for the war by the end of December 1970. McGovern was so committed to the cause that he refinanced his house to pay for airtime on behalf of his bill. Taking to the floor of the Senate, McGovern broke all previous protocol and accused “every senator in this chamber” of being “partly responsible for sending 50,000 young Americans to an early grave. This chamber reeks of blood,” he said. It was only his colleagues’ fondness for him and their appreciation for his sincere anguish over the war, which inspired this unprecedented attack, that allowed his relationships in the body to survive this serious break with the Senate’s tradition of comity and collegiality. After failing to move his Senate colleagues, however, McGovern took his arguments to America’s universities where antiwar fervor was high among both students and faculty. His traveling and his remaking of the Democratic Party went hand in hand as students and peace activists flocked to his cause. McGovern announced his presidential candidacy in January 1971. McGovern’s young staff worked until exhaustion pushing their candidate to front-runner status in the Democratic primaries and eventually to winning the party’s 1972 presidential nomination. But it was in many respects a pyrrhic victory, as the Democratic party was broken in half, with its more conservative and establishment-oriented members sticking firmly to the “Anybody but McGovern” stance—a strategy that had failed to slow the McGovern juggernaut on its way to the Miami convention. As liberal a candidate as any major party had ever nominated, McGovern gave a magnificent acceptance speech at the 1972 Democratic National Convention, but almost nobody saw it as the chaotic convention could not be brought to order for it to be delivered before 2:45 a.m., long after its television audience had gone to bed. Almost all that was remembered of his speech were the words “Come home, America,” which even in the age of declining support for the disastrous Vietnam War would prove a decidedly double-edged sword. 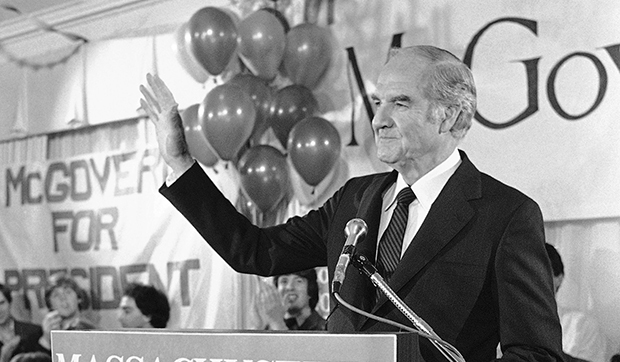 The slogan was manipulated by his opponents to imply the unfair “isolationism” charge, rather than McGovern’s clear intent, which was to prioritize America’s problems at home, rather than abroad. That label was repeated endlessly, to the point where America’s most influential pundit, The New York Times’s James Reston, in his column the Sunday before Election Day, said “the thought that the American people are going to give Mr. Nixon and his policies and anonymous hucksters and twisters in the White House a landslide popular victory … is a little hard to imagine.” And yet of the 1,054 dailies surveyed by Editor and Publisher, 753, or 71.4 percent, endorsed Nixon; only 56 papers backed McGovern. Of course the view of McGovern that permeated the media for decades was exactly wrong. Not only was he no elitist, pacifist isolationist, or hippie, but he was actually more willing to use military force than most of his Senate colleagues, whether Republican or Democrat, under the proper circumstances. In 1978, for example, he called for an international military force to oust the genocidal dictator, Pol Pot, from Cambodia—a move that, had it happened, might have saved millions of innocent lives. McGovern was mocked and attacked for this by most pundits, including the “dean” of the national press corps, The Washington Post’s David Broder. Still McGovern campaigned on distinguishing himself by forcing the rest of the Democratic candidates to direct themselves to a panoply of issues they would have preferred to ignore. By the time he bowed out of the primary race, Broder issued an apology in his syndicated column, which McGovern framed and hung on the wall of his dingy Washington, D.C., campaign office above a Dupont Circle Greek deli. Such unapologetic open-heartedness might not appeal to many pundits but it took more courage, toughness, and patriotism to keep fighting for them for more than seven decades without rest despite the mockery and derision of those deemed to be the “responsible” ones. I had dinner with McGovern during the 2008 presidential campaign. We discussed our hopes for that election, and he told me that at no time during those years did not he feel himself to be fighting for causes that were, in most politicians’ minds, marginal. And neither, I can tell you, did McGovern ever consider dropping those issues and causes and allowing himself a more pleasant and less demanding life. Eric Alterman is a Senior Fellow at the Center for American Progress and a CUNY distinguished professor of English and journalism at Brooklyn College. He is also “The Liberal Media” columnist for The Nation. His most recent book is The Cause: The Fight for American Liberalism from Franklin Roosevelt to Barack Obama, where a more detailed discussion of George McGovern’s courageous career can be found. George McGovern, Grassroots: The Autobiography of George McGovern (New York: Random House, 1977), 5. Bruce Miroff, The Liberals’ Moment: The McGovern Insurgency and the Identity Crisis of the Democratic Party (Lawrence: University Press of Kansas, 2007), 33. Quoted in: Gloria Steinem, Outrageous Acts and Everyday Rebellions (New York: Holt, Rinehart, and Winston, 1983), 87–88. Quoted in: Hunter S. Thompson, Fear and Loathing: On the Campaign Trail ’72 (New York: Warner, 1973), 127. Miroff, The Liberals’ Moment, 38. Bruce Schulman, The Seventies: The Great Shift in American Culture, Society, and Politics (New York: DaCapo, 2001), 166. Justin Vaisse, Neoconservatism: The Biography of a Movement (Cambridge: Harvard University Press, 2010), 84. Meany is quoted in: Philip A. Klinkner, The Losing Parties: Out-Party National Committees, 1956-1993 (New Haven: Yale University Press, 1994), 106. Theodore White, The Making of the President, 1972 (New York: Atheneum, 1973), 196–197. James Baughman, The Republic of Mass Culture: Journalism, Filmmaking, and Broadcasting in America Since 1941 (Baltimore: Johns Hopkins University Press, 1992), 177.